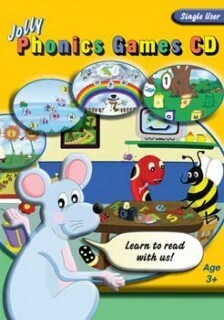 Enter the interactive world of Inky Mouse and her friends as they help children learn to read and write. With 20 fun activities, children will be able to practice all of the five skills in Jolly Phonics. The games are available in different levels: easy, medium or hard - ideal for children at all levels of early reading. The main menu features Inky's mousehole where all games can be accessed. There are seven zones, each teaching a particular skill. By clicking on each of these, children will be taken through a number of fun and enjoyable games. Levels of games: Easy - Suitable for a child who is just starting to learn to read and write. Medium - Suitable for a child who has learned most letter sounds and can read and write simple regular words. Hard - Suitable for a child who knows all the letter sounds can read and write longer regular words, and who is learning the alternative spellings of vowels.